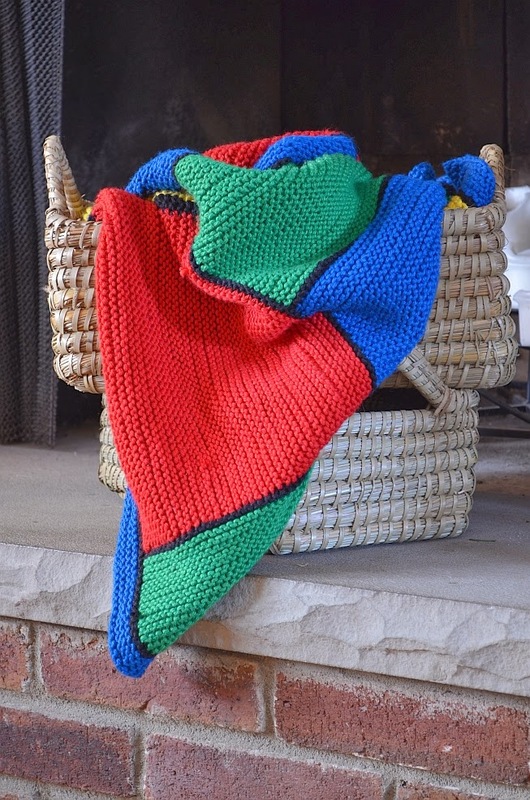 A couple of years ago, I knitted the Pickets Baby Blanket, for the baby of a member of our church. This year, the family was blessed with a new addition, a little boy named Benny. I knit another baby blanket. This time it was the Moderne Baby Blanket from Mason Dixon Knitting. I chose this pattern because I liked the look of the blocks. I picked the colors because I didn't want to knit the normal baby blue blanket, but wanted something with a stronger look. Once I finished it, I decide it reminded me of the legos my kids used to play with. Keep in mind that I always over-order yarn. The numbers above are the number of skeins I ordered - it was more than enough. I used a US #4 interchangeable needle from Knitpicks. This is smaller than what the pattern calls for, but I always go down a needle size. The pattern is Moderne Baby Blanket from the book Mason-Dixon Knitting. Since the yarn I used was not the one from the pattern, I had to alter the number of stitches and rows to adjust the size. Once I established the first garter stitch count for the first block, I was able to just proportionally adjust the row count for all of the other blocks. The proportion was 14/28/42. I also added black rows between the blocks. 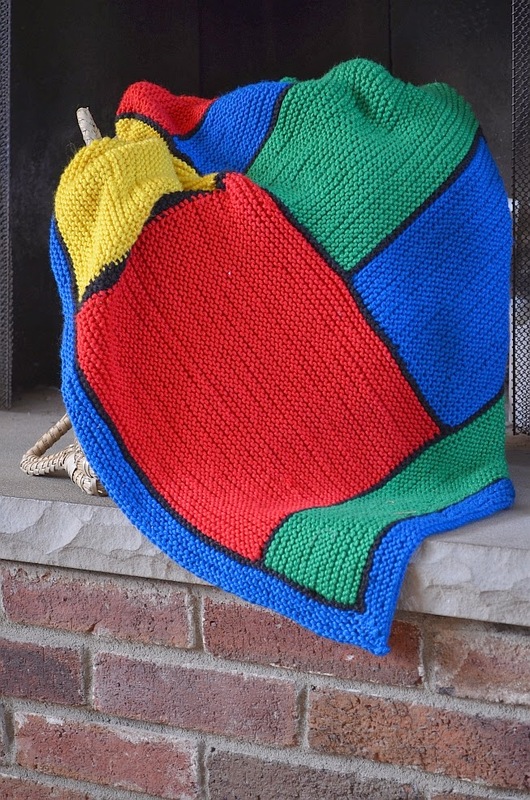 I was inspired by this blanket on Ravelry. Instead of picking up stitches with the next color, I picked up stitches with the black. I then knit a row side row with the black, and then I started with the next color. This was only a problem on the portions of the blanket that are intarsia. The first time that happened, I added two black stitches between two colors. 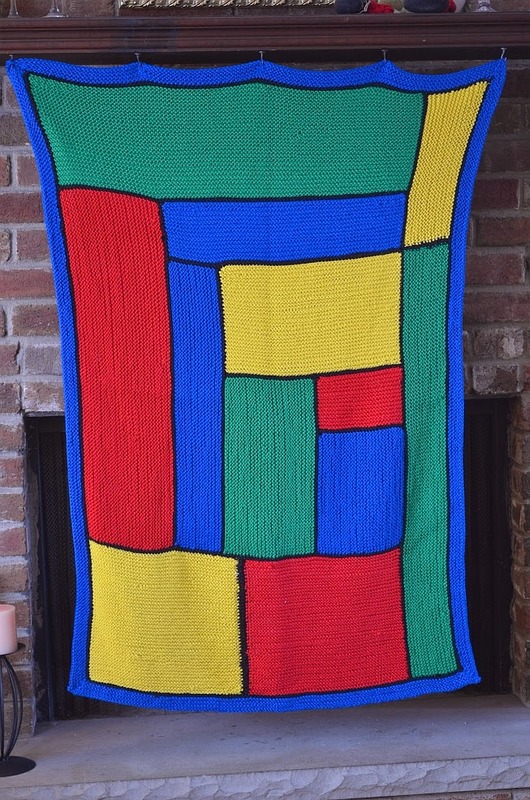 It's between the large yellow and red blocks. The stripe is too wide. The next time I used 1 stitch of black, which worked better. This was the first time I have done intarsia, and I have to say that I didn't really like it. It worked OK, and I did the twisty thing (twist the two yarns together) which prevented holes, but it slowed my knitting down too much. I started in the middle of August of 2013 and finished in the middle of November of the same year. The pattern was fine, and I would recommend it. The yarn choice was good, too. The blanket was very soft and drapey.